Everyone's favorite time of year is here and the Racers are back in the tournament. The Racers play their first game on Thursday (3/15) at 12:15 p.m. (EST). Be sure to pull out your blue and gold gear and support the Racers! It seems like basketball is among wallyball, stairs, and a handful of other athletic endeavors the team has used to break the monotony of winter erg training. But let’s face it, if you threw a basketball to most rowers, it would hit them in the face and break their glasses (sorry, Moode). Despite the great size and athletic advantage many rowers have, there is just something about our collective coordination skills that guaranteed we’d be chosen last for playground pick-up. Nevertheless, we have had some very talented basketball players come through the MSU Rowing program. In honor of March Madness, I give you the following All-Time-All-MSU-Rower Basketball Team. This is totally subjective, so feel free to debate in the comment section. F - James Donahoe – Bred in the basket ball crazed bluegrass region, this thoroughbred athlete will dunk on your mama. G – Jackie Tangerose – A very skilled basketball player made even better by her competitive spirit. Her dislike of losing was Jordanesque. C - Pat Mulcahy – A Sweet 16 competitor, son of a basketball coach, basketball fanatic. His high basketball IQ and tremendous skill shined even during his years with baby weight. G - Matt Weaver – I would say he’s the smartest,quickest, most-competitive, and best basketball player we’ve ever had, but he’d complain I was leaving out some superlative. Beautiful cross-over. F – Steve Irvan - The second first team selection spawned of legendary coach Jimmy Long, Steve’s unassuming demeanor belies strength and hustle that wins on pick-up courts across campus. He is the difference-maker. C - Adam Weckman – One of the greatest athletes in Racer Rowing history. His refusal to participate in high school athletics perhaps inhibited his development as a basketball player. G - Joe Kayse – Solid all-around game. No swagger, just fundamentals. If he played in college, he’d play for Duke. And I say that only because he hates Duke. G – Jenny Engeberg - She makes this list on shear athletic ability alone. F - Jason Holman – His pterodactyl-like wingspan aids a slinky body that helps him slash and rebound. A silent player who wills the ball to go in with his mind. F- Todd Wilson – One of the best rebounders of all time. A certain part of his anatomy gave him the uncanny ability to block out. *Travis Swan and Chris Glass likely would have made first or second team had they rowed more than one semester. wait...why isn't DLav on the list?? I think we should play 1st Team vs. 2nd Team. And, I would never play for Duke Dan. I don't flop around or slap the court when I play defense. Dan, Jason, and I were in a Graduate School 3-on-3 basketball league in 2001 or 2002. We were named by our competitors "The Young Guns," because of our considerable age advantage. The league seemed to be primarily made up of mean old guys. Lavit tells the story better than I can--because in addition to having poor physical skill on the basketball court, I also am not great at retelling play-by-play details of a game from 10 years ago. However, the short of it is that Dan and I practiced a play for just under an hour before one of our games....Basically, he'd move into position to shoot from the top of the key and then bounce pass the ball to me under the net where I could make a relatively easy layup shot (if I wasn't mysteriously kicked in the head...a story of another game for another time). Anyway. In spite of all this practice, I didn't catch Dan's pass. The ball smacked me in the face. My glasses flew off my head. Hey--what was our win/loss record for that little athletic experiment? Weren't we like 13-0? With two other guys on the team, you can't blame all of the season on me! Can you? I'll take Weckman and Holman and the 3 of us will take your best 5. Glad to see so many ancients represented. This reminds me of the time I got a call from coach Holman to attend a basketball practice to knock this Weaver kid down a notch. An hour later he was put in his rightful place - although he is still worthy of 1st team status (the score was close, just not in his favor). How did Joe Kayse make this list? Overrated.... much like the frontrunning team he roots for. 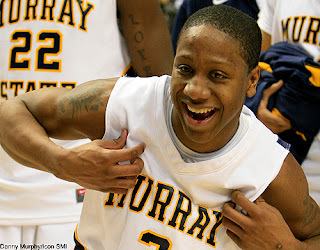 Go Racers, Go Bearcats, and let's hope the Wildcats choke again. Weaver, to maintain an air of objectivity, I kept myself off the list. I'd probably make honorable mention. Joe, I'm sorry, but I think the first team would treat the second team pretty bad. Your suggestion is worth testing. Homecoming? Moode, I think we were 0-13. You were named MVP at the team banquet at Mr. Gatti's. Remember? Pat, your fanaticism for UC basketball is imprudent. Why not just come over to the dark side? I do agree with your assessment that Joe Kayse is overrated.